I’ve updated my personal GFCF (and Feingold) cookbook and put it into a PDF document. Each recipe is on a separate page, making it easy to print out and place in your own binder. I also place mine in sheet protectors. I recommend printing two-sided to save on paper (and to lessen the weight of your binder if you are using sheet protectors). There are also pictures to go along with most of the recipes. Below is the table of contents. 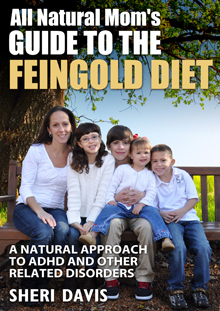 I’m offering this PDF cookbook for FREE for a limited time for those that leave a review on Amazon of my new book, “All Natural Mom’s Guide to the Feingold Diet – A Natural Approach to ADHD and other Related Disorders.” I also have a Feingold Stage One Cookbook that I am also giving away. Click here to view the table of contents. To receive this free PDF, just send me an e-mail at sheridavis205@comcast.net letting me know that you have left a review on Amazon along with the Amazon user name the review was left under. Also please let me know if you would like the GFCF Cookbook or the Stage One Cookbook (available soon). Please do not leave a review unless you have read the book obviously. To leave a review, just pull up the book on Amazon, or click here. Scroll down to the bottom of the page and on the left there is a gray rectangular button that says “Write a Customer Review.” You may need to do this from a computer and not your phone though. I will e-mail you the PDF to download within 48 hours (usually less). I will not use your e-mail address to solicit. I will only notify you of any free e-book promotions or future new book releases. Also, don’t forget, if you leave a review by Feb. 20th, 2015 and leave a comment on my Facebook page, you’ll be entered to win a FREE Feingold membership as well! See this post for details. 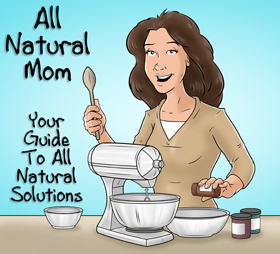 Be sure to “Like” All Natural Mom on Facebook to be notified of any future promotions. And follow along on Pinterest at AllNaturalMom4 for new recipes. 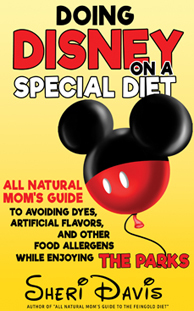 For an insider’s view on the Feingold Diet, and tips and encouragement in getting started, check out my new book, “All Natural Mom’s Guide to the Feingold Diet” now available on Amazon in e-book and paperback! 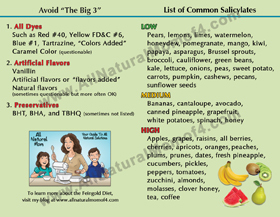 Posted in Feingold Diet, GFCF Diet and tagged All Natural Mom's Guide to the Feingold Diet E-Book, Feingold and GFCF Recipes, Feingold Diet Info, GFCF Diet Info. We've been Fiengold for years, but struggle as the kids become teenagers and fight"the system". This book gives great talking points and Is a wealth of information to assist in keeping on track. It's great to know we're not alone and to find tricks of the trade and tons of resources! Hello! I know the date is long past. Where can I find your cookbook to download/purchase? I have kids with tons of sensitivities and most of the symptoms you have described. We’ve been paleo for a number of years but have cheated too much. We’re trying to get our eating to match the ADHD diet; I’m sure it will help everyone involved. Thank you for your super helpful website.